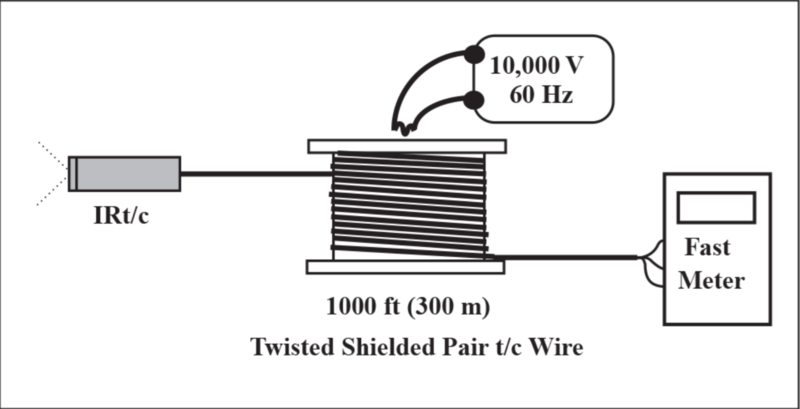 With twisted shielded pair thermocouple extension wire, an IRt/c can be mounted as far as 1,000 (300 meters) from the readout device, even in a very erce electrical noise environment. The extraordinary noise suppression characteris cs designed into the IRt/c make this possible, without using a transmi er. The IRt/c housing is electrically isolated from the signal leads and is connected to the shielded ground of the extension cable. For long distances, the twisted shielded extension cable should be used, and the shield connected to a good electrical ground. A demonstra on test was performed with a 1000 (300 m) coil of twisted shielded pair of extension wire, with 100 (30 m) unwound, connec ng an IRt/c to a fast (100 msec response) A/D conversion module to a computer. As a noise generator, a 60 Hz 10,000 volt transformer and spark generator was set up to spark within 6 inches (15 cm) of the wire. The test results showed less than 0.1°C of noise at any rela ve posi on of the wire, spark, and transformer.